Ice hockey team Lokomotiv. 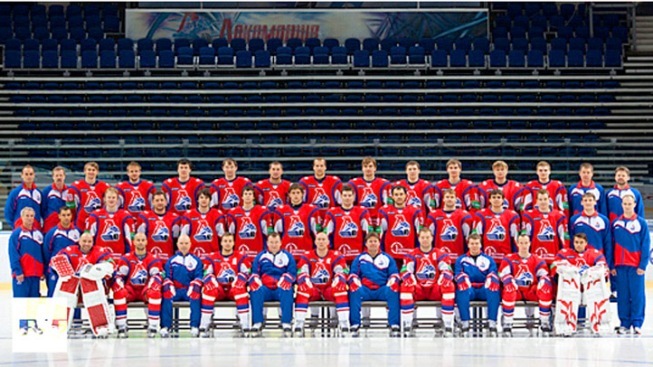 Photo from the website of the KHL. A plane carrying a top Russian ice hockey team crashed on its way to the season's opening game on Wednesday, killing all but one of its players and several former National Hockey League stars. At least 43 of the 45 onboard the Minsk-boand flight were killed in the crash carrying the professional Lokomotiv team, according to The Associated Press. The two survivors-- a crew member and 26-year-old forward Alexander Galimov--are in serious condition, officials said. Lokomotiv Yaroslavl, which plays in the Kontinental Hockey League, includes several former NHL players. Pavol Demitra, 36, a perennial all-star and former member of the St. Louis Blues, Vancouver Canucks and Minnesota Wild, was a member of the team. Other members of the Lokomotiv team included former Rangers defenseman Karel Rachůnek, 32; 36-year-old veteran NHL defenseman Ruslan Salei, who recently played for Detroit; and 37-year-old Karlis Skrastins, who played most recently for the Florida Panthers and Dallas Stars. Center Josef Vasicek, 30, also played for the Carolina Hurricanes and New York Islanders from 2005-2008. Alexandr Vayunov was a highly-touted NHL prospect and played a few games for the New Jersey Devils. Head coach Brad McCrimmon, a 52-year-old Canadian, also played for a number of NHL teams for an 18-year stretch in the 80's and 90's. He won the Stanley Cup in 1989 with the Calgary Flames and was an assistant coach with the Detroit Red Wings before leading Lokomotiv. The Yak-42 passenger plane caught fire shortly after takeoff from the central Russian city Yaroslavl and crashed into a riverbank. Russian President Dmitry Medvedev has announce plans to take aging Soviet-built planes out of service beginning next year, The Associated press reports.The Yak-42 has been in service from 1980. Another Russian passenger jet had crashed in the northwestern city of Petrozavodsk in June, killing 47 people. Pilot error was blamed for the accident. The KHL, which includes teams from Russia, Belarus, Kazakhstan, Latvia and Slovakia, has aggressively courted former NHL players, including all-time great Jaromir Jagr.